Ask, and you shall receive. After requesting a tango with Tito Ortiz (pictured) in Bellator’s pay-per-view debut, Bellator middleweight champion Alexander Shlemenko has been granted his wish. On Friday night, Bellator added the shootout to their May 17 event. It is doubtful Ortiz could make middleweight at this stage of his career, so the contest will likely take place at a catchweight, which Bellator loves to do, or at light heavyweight. 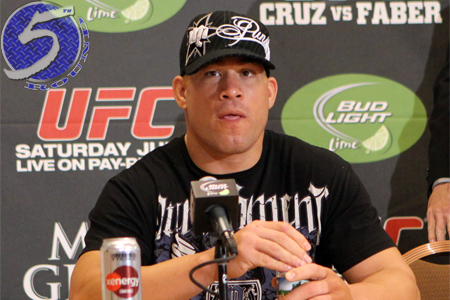 Ortiz retired from MMA after losing to Forrest Griffin at UFC 148 in July 2012, just hours after he was inducted into the UFC Hall of Fame. Bellator signed Ortiz last year to meet Quinton “Rampage” Jackson, but Ortiz was forced to withdraw after fracturing his neck. Ortiz, now 39, announced via Twitter Thursday that he was medically cleared to return to action. “The Huntington Beach Bad Boy” (I refuse to acknowledge Ortiz as “The People’s Champ” because everybody knows only The Rock can don that moniker), hung up his gloves with just a 16-11-1 record, having gone only 1-7-1 over the last eight years. At only 29 years of age, Shlemenko owns an astonishing 50-7 record. The Russian hasn’t lost a fight in 13 outings, a torrid run that began in March 2011. “Storm” captured the vacant Bellator middleweight title by knocking out Maiquel Falcao. He’s since successfully defended his throne three times. Landers Center in Southaven, Mississippi hosts the festivities. A trilogy between lightweight champ Eddie Alvarez and Michael Chandler serves as the main event.